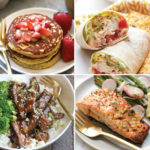 Throw all of the ingredients for this Meal Prep Sheet Pan Tofu Quinoa Burrito Bowls on a baking sheet and you’ve got a delicious, vegetarian meal ready for the entire week! It’s @linleyshands here to say HAPPY NEW YEAR! I hope you all had a fantastic holiday season full of delicious food, family, friends, and some downtime! Cole and I spent the holidays in Captiva, Florida with is his family. There’s just nothing like the beach when it’s -15 below in Minnesota. Am I right? We ate fresh fish, spent time together, and played beach games (one of which involved Crisco and a watermelon…). We had a blast. I did get home ready to be on some sort of schedule again. January is a big month for FFF and I missed Lee, so jumping right back to work was definitely welcomed when we got home this last weekend. I’ve been thinking a lot about intentions for 2018. Last night after work I headed home to make some tea and journal a little bit about what 2018 had in store for me (If you watched FFF’s insta story this week, you already know the story I’m about to tell you). While making tea I see FLAMES out of the corner of my eye. My tea kettle was on FIRE. Like, big flames. I grabbed a pot full of water and avoided a house fire. My tea kettle even survived (with a charred handle, but still useable). Frazzled from the fire, I cozied up on the couch to chat with my roomies. Chatting away, I smelled something a bit funny…like something was burning. I looked down at my feet and the blanket I was using was on fire! It somehow caught fire from the candle I had burning. After two fires in one night, I decided to call it a night and head to bed early at 8:00 pm. I set my alarm bright and early to start the day off right, get a cup of coffee in before work. I prepped my French press, boiled some water, and while pouring boiling water into my French press, the cap of the tea kettle fell into the french press, burning my palm. WTH. No big deal, I can handle a burn. BUT GUESS WHAT? That’s not it. While continuing to pour boiling water into the French press, it EXPLODED. That’s right, my french press exploded. You just can’t make this stuff up! 2018, I hear you! I figure I’m getting all the fires and burns out of the way early in 2018. So, I’m going to burn sage, say some prayers, and revisit my 2018 intentions this evening. Find somewhere to volunteer. I used to donate most of my spare time to some of my favorite non-profits. It’s time to start again and finds somewhere that needs an extra hand. Let things go. I’m a fixer and a fixator. If there’s drama, I try to fix it. If something happens or someones mad, I fixate on it. 2018 is the year of just letting it go. Yoga teacher training. I have always wanted to get my yoga certification, so this is the year. I’m not sure what season, but we’re going to make it happen. Budget. I need to make a budget and actually stick to it. I want to up my savings and have more of a grasp on where I actually spend my money. There you have it. Some of the things I’m going to try and be mindful of this year! I’ll keep you updated. 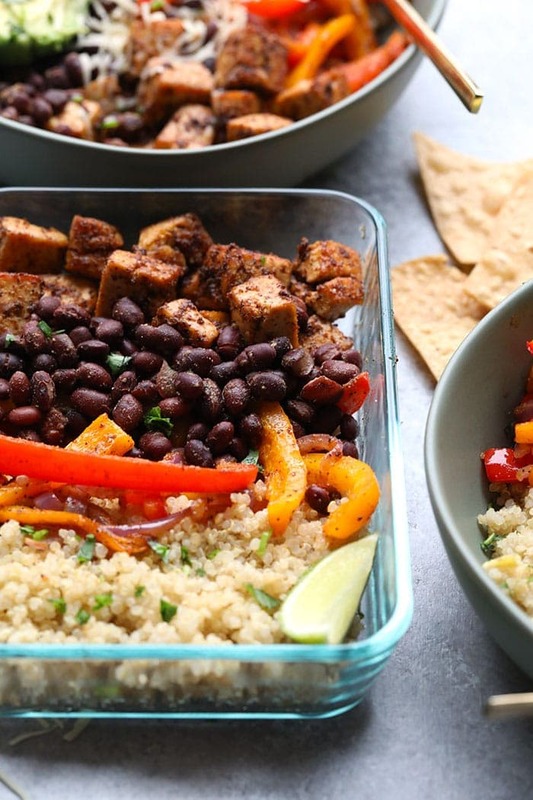 But now, how about we chat about these Tofu Quinoa Burrito Bowls. Lee and I don’t eat a ton of tofu, but when we were testing recipes for the HGG Reset we used ingredients that were outside our comfort zone and it was wonderful. We grew and became pretty excited about experimenting with new ingredients in 2018. These tofu quinoa burrito bowls were our first tofu test in a while and we are SO excited about them. 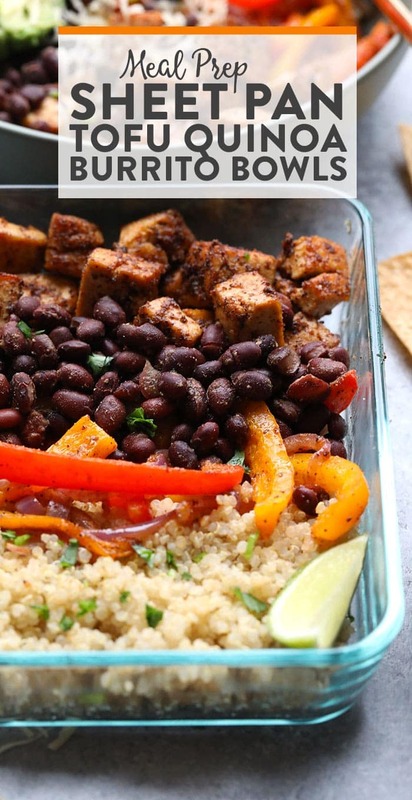 Not only is the tofu in this recipe flavorful, but it is packed with delicious veggies, beans, and quinoa so you get your dose of fiber, vitamins, and protein for the day. 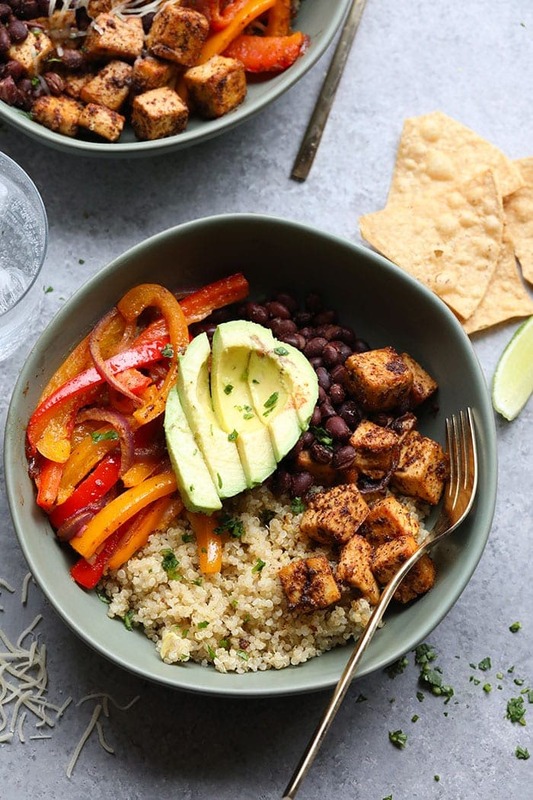 These tofu quinoa burrito bowls are perfect for meal-prep during the week and for dinner on #meatlessmoday! 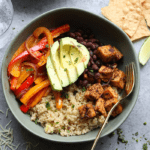 Throw all of your ingredients for this Meal Prep Sheet Pan Tofu Quinoa Burrito Bowls on a baking sheet and you’ve got a delicious, vegetarian meal ready for the entire week! In a large pot, bring quinoa and water to a boil. 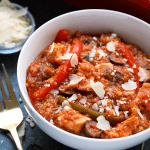 Cover and lower the heat to low and let simmer for around 15-20 minutes or until all the water has evaporated. Preheat oven to 400ºF. Spray a baking sheet with cooking spray and set aside. Remove tofu from packaging and place between two pieces of paper towel or wrap in a tea towel. Place the wrapped tofu on a plate and put a cast-iron pan on top of the tofu (or anything heavy). Let sit for 10 minutes in order to remove as much moisture as possible. Slice peppers and onion and then place in a medium-sized bowl. Add olive oil and spices and toss until combined. Place on one half of the baking sheet. Remove tofu from the towel and chop into bite-sized cubes. 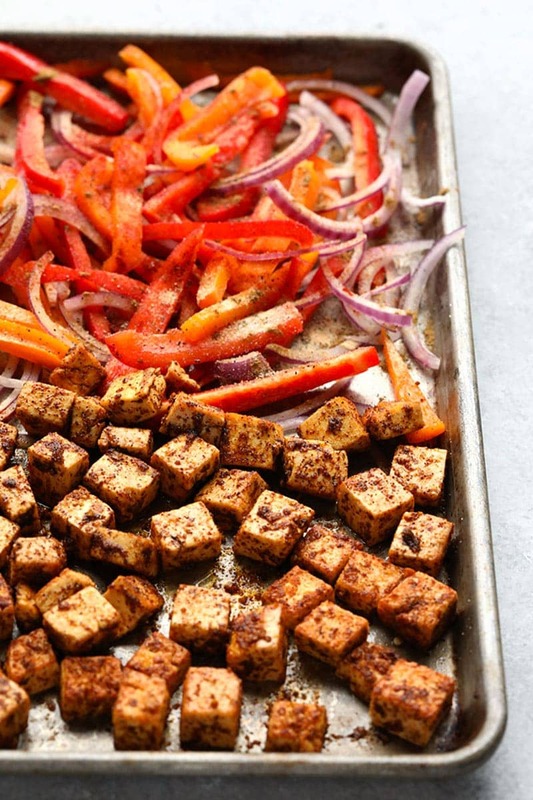 In a medium-sized bowl, toss tofu with spices. Heat a large skillet over medium/high heat and add olive oil. When olive oil is fragrant, add tofu and saute for 5 minutes. Then, transfer to baking sheet. Bake tofu and peppers at 400ºF for around 15 minutes, tossing halfway. Heat a small pot over medium/high heat. Place all ingredients for the beans into pot and bring to a boil. Once simmering, remove from heat. 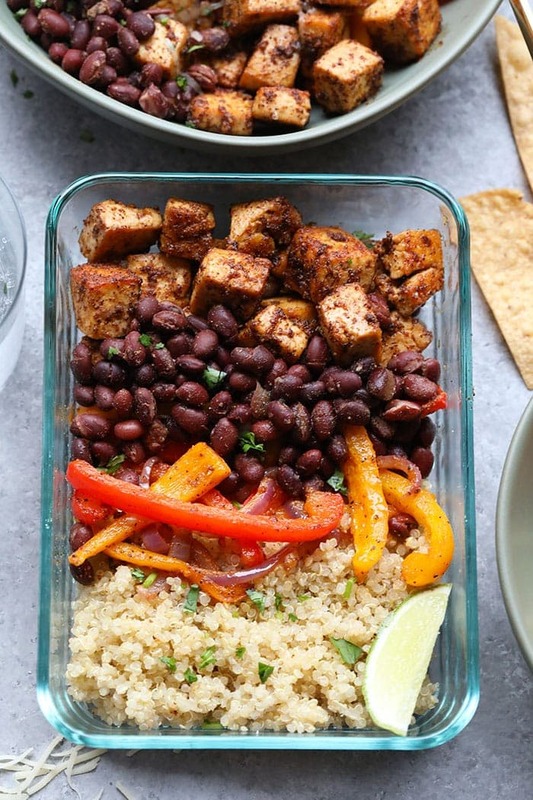 Assemble bowls by equally separating quinoa, tofu, peppers, and black beans into four equal bowls and enjoy! Serve with avocado, fresh cilantro, and a squeeze of lime. Will last in the fridge for up to 5 days!